Today I will blog about my blog. I feel quite uncomfortable about it, and am very afraid that I will completely disappear up my own bum. On 24th September 2012 meta4RN.com was launched with two posts. One said “Hello World!“, the other post “About” set the agenda and explained the rationale for the blog. Now, exactly 12 months later, let’s see what’s happened. Serendipitously, the 11,000th hit on meta4RN.com happened on the day of its first birthday. Actually, it wasn’t coincidence at all – it was more the desperate attention-seeking of somebody sad enough to write a blog about his blog. I could see that the milestone was getting close and started promoting pimping various pages of meta4RN.com on Twitter from about 5:00am. Twitter accounts for nearly a quarter of all hits on meta4RN.com. To the best of my ability I’ve tried to mimic the Twitter style of @mamamia – they take the “pimp your blog” idea to the next level with around-the-clock, mostly-not-repetitive, nearly-always-poignant-funny-and/or-interesting Tweets promoting mamamia.com.au content. When I’m pimping my blog I use scheduled tweets and a bit of imagination to try to channel the mamamia style of Twitter wit and wisdom. The blog has attracted over 100 comments, and I am very grateful for the support of all those who have referred/linked to the meta4RN site. Overall there are about 90 websites and oodles of Digital Citizens that have directed traffic in this direction – my sincere thanks to you all. 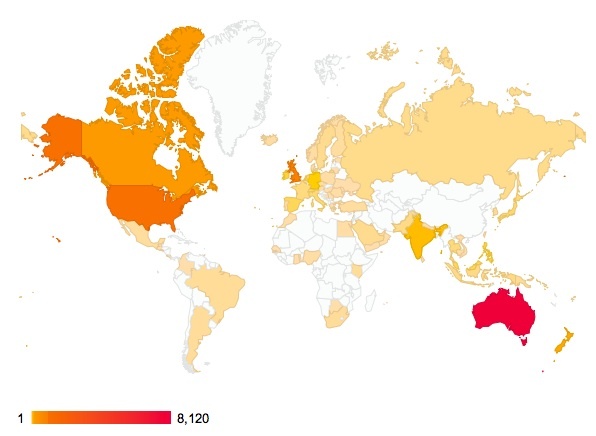 There have been meta4RN.com views from 85 countries, however many of these countries have visited less than a handful of times. In this section, let’s have a look at things that have not gone so well. Quantity: The original idea was for a post a week – that has not been achieved. There have been 33 posts in the first 12 months (this one will be the 34th). I’m planning to change the original goal to at least two posts per month – that’s more realistic for me: somebody with a fulltime job, a social life, and a bad habit of being verbose and over-inclusive when writing blog posts. Like now, for instance. Reach: as per the map above, meta4RN.com has totally failed to capture the all-important Chinese market. 我要加倍努力接触到中国的护士。Not doing at all well in cracking Greenland either. Damn. Dud Posts: Less than 50 visits have been made to these three posts – a poor reward for effort, but also an indication that sometimes I waffle-on about stuff that not many people care about. Appearance: I really dislike the random hyphenation of this blog. It is truly awful and ugly sometimes. Also, the overall look if meta4RN.com is a bit daggy. I might give it a bit of a refresh in coming weeks/months – stay tuned. This is a meta post – like a conversation about conversations (see number 5 here: meta4rn.com/about). The purpose of this post is not to show the answers, but to show my working-out… you know, just like my Year 5 maths teacher always said, “Getting the right answer can be dumb luck – I want to see how you arrived at the answer! Show how you worked it out!” Hopefully somebody can pick-up some ideas from seeing the working-out of a nurse who blogs. I didn’t know what “blog” meant until about 12 months ago (slow, i know). It is word play from the original “Web Log”, which was contracted to “WebLog”, which was playfully converted to “We Blog”, which then left the thing that “we” do as a “blog”. Cute. I am pleased to have an avenue of conversation about professional matters that is not constrained by the traditions and discipline of academic journals. I think the language we can use on blogs is much more accessible, and the freedom of sharing ideas for consideration is liberating. Practice-based-evidence instead of evidence-based-practice. It’s still peer reviewed, but is not hidden behind a paywall. Professional blogs are not in competition with journals, and will never attain their level of academic credibility. However, hopefully these sort of blogs can go some way towards bridging that long-lamented theory-practice gap. I hope so. When introducing meta4RN.com this time last year, I acknowledged Ian Miller of impactednurse.com and all those who participate in Health Care and Social Media in Australia and New Zealand (#hcsmanz on Twitter). I want to reinforce my thanks for their support and inspiration now. Ian is especially impressive in leading the way for digital citizen health professionals. Melissa Sweet of @croakeyblog on Twitter and croakey online plays a significant role in sharing health-related information in the social media environment. I have been especially grateful for Melissa’s feedback and support for some of the meta4RN.com blog posts. Very rewarding and gratefully received. My partner Stella is incredibly tolerant of the time I have spent on something that does nothing to pay our mortgage or enhance our social life together. I am especially grateful to Stella for affording me the luxury of experimenting in this space: thank you darling. Thanks very much for reading meta4RN.com – as always, your comments are welcome. This entry was posted in Blog and tagged blogging, communication, geeky stuff, nursing, Twitter on 24 September 2013 by Paul McNamara. 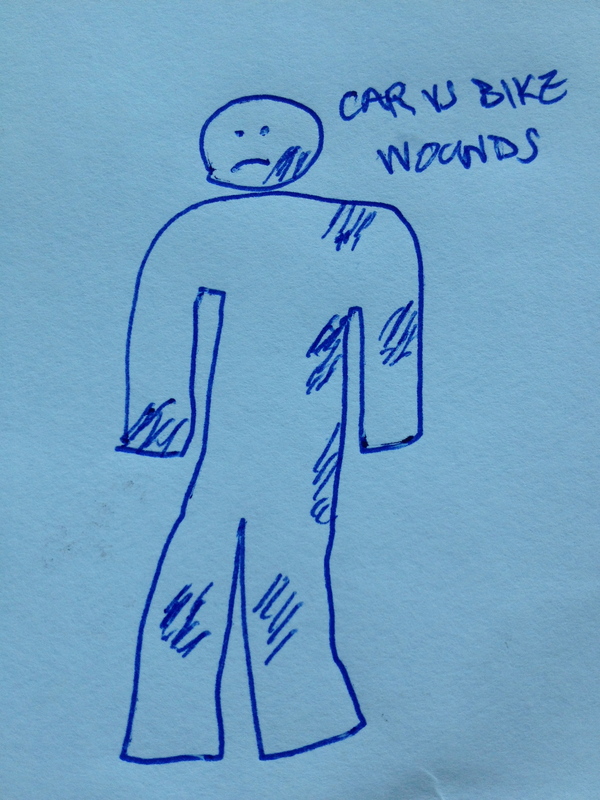 Gingerbread Person Pic “Car vs Bike Wounds”. Even an illustration that completely lacks artistic merit can convey a lot of information more effectively than a page full of text. This week at work we have been discussing the roll-out of the ieMR (integrated electronic Medical Record). At present it is not integrated with the existing mental health system (CIMHA: Consumer Integrated Mental Health Application), the existing emergency department system (EDIS: Emergency Department Information System) or the existing intensive care unit system (CIS: Clinical Information System). Let’s not be too distracted by that though – apparently there is an integration team beavering away in a back room somewhere: they’re teaching these hospital systems to talk to each other. Once that’s sorted-out the ieMR will be the best thing since bung fritz. 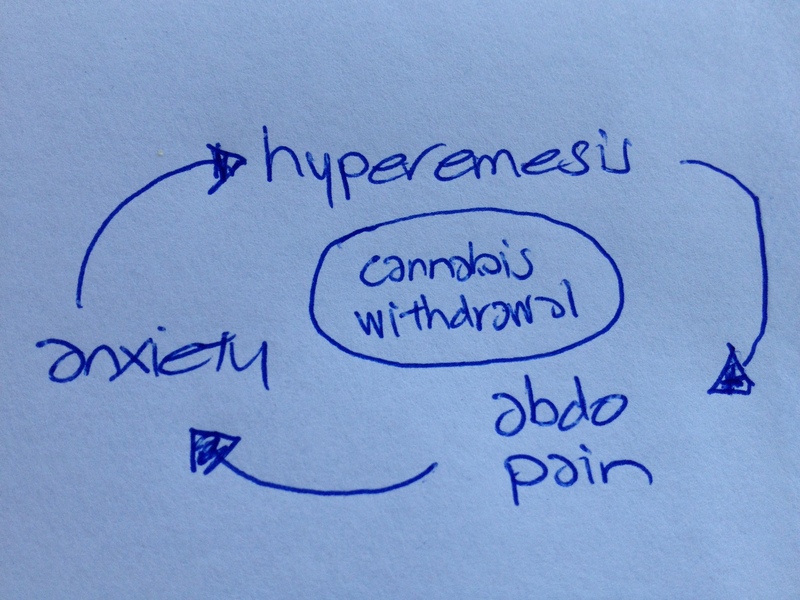 A hospital file diagram such as this can assist in conveying an understanding of the patient’s experience. A different thought crossed my mind though – will the ieMR make the bad art of gingerbread women/men, genograms and other diagrams obsolete? I hope not – even my hastily drawn-on-an-envelope examples used on Twitter during the week and in this post convey meaning quickly and easily (hopefully). Don’t get me wrong – I’m all for typing words into a digital archive (in fact, I’m doing it right now! ), but there are times where it is clearer to communicate with an illustration. I hope this is not lost as we transition to an electronic medical record. The patient is the expert. 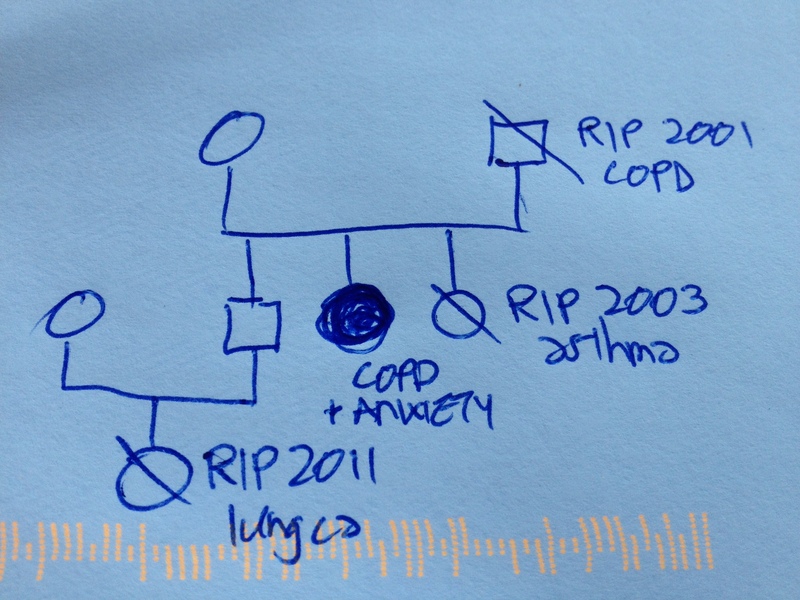 The clinician asks them about their family and draws a genogram to organise information. Sometimes genograms explain a lot. Does your hospital/health agency have an electronic record that easily allows illustrations still? If so (or not) I would be grateful to hear from you in the comments section below. This entry was posted in Blog and tagged communication, consultation liaison, electronic medical records, ieMR, nursing on 21 September 2013 by Paul McNamara.